After picking the Railway as our target earlier in the week I had no idea that we had visited before until I looked up the address as we were headed out the door. Back in 2011, for attempt #38 we visited an Irish pub in Yarraville known as the Blarney Stone. 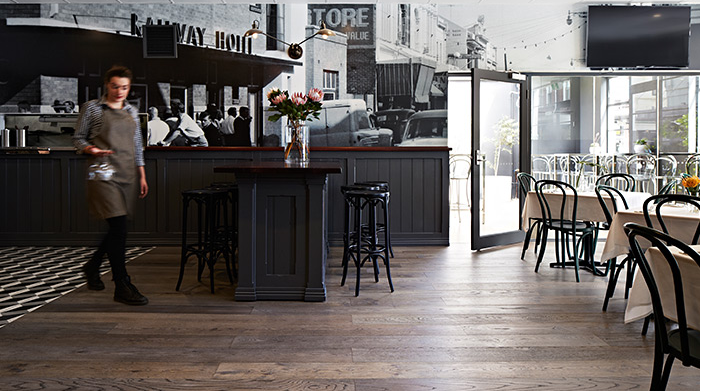 I had heard many great things about this new pub in the area called the Railway Hotel ... But I never put two and two together that they were the same pub. I had no idea the Blarney had even closed its doors. We picked the Railway based on a recent article in the Herald Sun that listed the state's top parmas. The article touted the Railway as 3rd best in the state - and was the only pub in the top 5 that we had yet to visit. Naturally, that put it on the top of our list. So we loaded up the parma bus and headed to the shockingly narrow streets of Yarraville to see what they had to offer. Inside, the newly renovated Railway Hotel is very impressive, A million miles ahead of when it was the Blarney. The front bar is spacious with plenty of table space available, plenty of TV's to catch the sport of the day and even has a cosy courtyard off to the side for when the sun comes out. The dining area out the back is a bit more formal, but equally as impressive. After last week's booking debacle I made sure to call ahead this week and reserve a table, which put us in the dining room for the evening. The tap list was adequate. Nothing too crafty but still a few options. I opted for the Cricketers' Scorcher for most of the night - A lovely drop. The schnitzel was big enough, but quite (and I'm going to use a this word a lot in the following few paragraphs) bland. The chicken was quality breast, but quite dense and lacking a lot of moisture, which had all seemed to have soaked into the crumbs - which were a soggy mess by the time the parma hit the table. It was thick enough, and cooked quite well, but completely devoid of personality. A competent foundation for the parma, but by no means perfect. The toppings are where this parma really goes off the rails. First up there is no ham, for a $22 parma I find this very surprising as ham is usually the first thing to go when there are cost cutting measures in play for a parma - But I always say that a parma can easily survive a lack of ham if the other elements are quality. The parma that started this website at the Prince of Wales Hotel didn't have ham and we still consider that the best parma that ever existed. I could see the napoli on the parma when it was put on the table, but there was so little of it they might as well have not even opened the can. You can see from the cross section photo above that this meal was basically a chicken schnitzel with cheese - the napoli was completely undetectable. The cheese could have done with another few minutes under the grill and was mostly pretty bland. That's exactly what this parma was - bland from top to bottom. The chips were the best thing on the plate and the saving grace for this parma. Beer battered, well seasoned, crispy and hot with a pillowy center. Tomato sauce was supplied on request without hesitation for some much appreciated chip dippage. My only criticism being the serving size - Just a half of a handful too small to be satisfying. The garden salad was pretty decent. Granted I picked a lot of the onion out to put with the parma to give it some semblance of flavour. But all the ingredients were fresh and crisp - with a rather flavoursome dressing. Not the best thing on the plate, but not the worst ... a fine side to the meal. After finishing the meal we sat in shock. How could this have gotten voted #3 in Victoria by the Herald Sun? I re-read the write up that was printed and it suddenly became very clear. 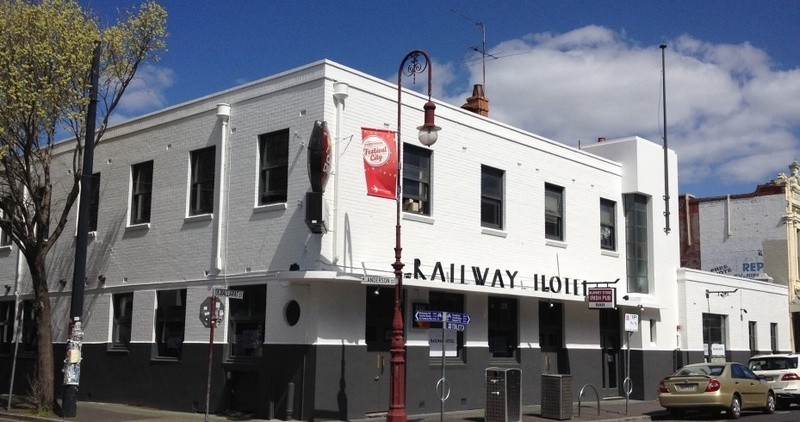 The Herald Sun reviewed the Railway on a Tuesday night. Tuesday night is a whole different ball game, as the price drops to $15 per parma with a choice of original, satay, Mexican, meatlovers or Mediterranean. Thats what this parma needs. Novelty toppings. With the quality chips, salad and okay chicken breast, if you throw some meatlovers or Mexi-toppings on this parma and it would have come to life! But as it stands on every other day of the week the original parma is severely lacking in the flavour department. As much as I enjoyed the look of this pub I can't bring myself to recommend it at full price. $22.50 is far too expensive for a parma without ham and minimal napoli. It might be worth checking out on a Tuesday from the Herald Sun's recommendation alone - and if not you're only out $15, but on any other night I'd give it a miss.